The number of global gene expression studies has increased significantly in recent years. It is assumed that the different techniques employed report similar levels of gene expression for each sequence type. While this may be true for many species, polyploids containing homoeologous and paralogous gene copies represent a unique situation. 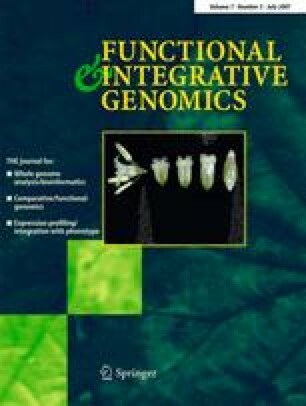 In this paper, we describe the comparison of the Affymetrix GeneChip® Wheat Genome Array, an in-house custom-spotted complementary DNA array and quantitative reverse transcription-polymerase chain reaction (PCR) for the study of gene expression in hexaploid wheat. Analysis of the data generated from each platform revealed little concordance and suggested that global comparisons are not possible. Potential causes of these inter-platform discrepancies were investigated and revealed to be due to the inability of the platforms to discriminate between different but related transcripts. Our results also showed that the traditionally used array validation technique, quantitative reverse transcription PCR, differs in its discriminatory ability, resulting in the poor confirmation rates seen in previous polyploid studies. These findings have implications for gene expression studies in polyploid organisms and highlight the need for homoeologous- and paralogous-specific arrays when investigating polyploid gene expression. The online version of this article (doi: 10.1007/s10142-007-0046-7) contains supplementary material, which is available to authorized users. We are grateful to the Biotechnology and Biological Sciences Research Council, UK (BBSRC Agri-Food), for providing the main funding for this work (ref. D17385). Ian Wilson was funded by a BBSRC GDB award (ref. BBSB07446) and Gary Barker by a BBSRC GDB award (ref. G20322). Our thanks to Andrew Hughes and Guy Donaldson for their invaluable assistance with the controlled environment growth of wheat plants. S1 All data for three technical replicates of the Affymetrix GeneChip® Wheat Genome Array (XLS 27.189 mb). S2 Cluster 1 from the AutoSNP (Barker et al. 2003) output of ESTs that match the array features of Pair 4 with BLASTn expect score E ≤ e −20. Coloured bases within each sequence represent putative SNPs (HTM 435 kb). S3 Cluster 2 from the AutoSNP (Barker et al. 2003) output of ESTs that match the array features of Pair 4 with BLASTn expect score E ≤ e −20. Coloured bases within each sequence represent putative SNPs (HTM 56 kb). S4 Cluster 3 from the AutoSNP (Barker et al. 2003) output of ESTs that match the array features of Pair 4 with BLASTn expect score E ≤ e −20. Coloured bases within each sequence represent putative SNPs (HTM 329 kb). S5 AutoSNP (Barker et al. 2003) output for all sequences that match the array features of Pair 2 with BLASTn expect score E ≤ e −20. Coloured bases within each sequence represent putative SNPs (HTM 35 kb).